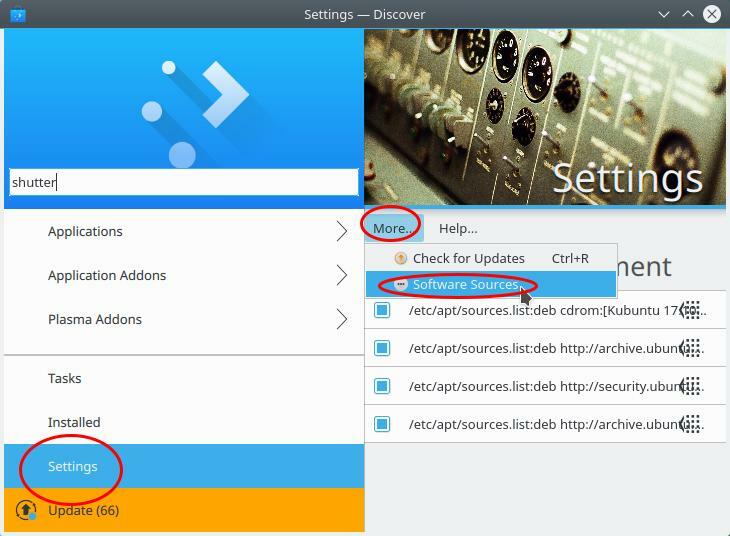 Know how to install applications on Kubuntu. This Part 3 of Kubuntu Guide the Series introduces you 2 things: (1) what applications available for you (2) how to install applications you need using Kubuntu Discover as well as upgrading any application using Kubuntu Muon. This article also introduces you Kubuntu programs that are replacements for MS Windows programs (see table below). The purpose of this article is so that you quickly able to get what you need. 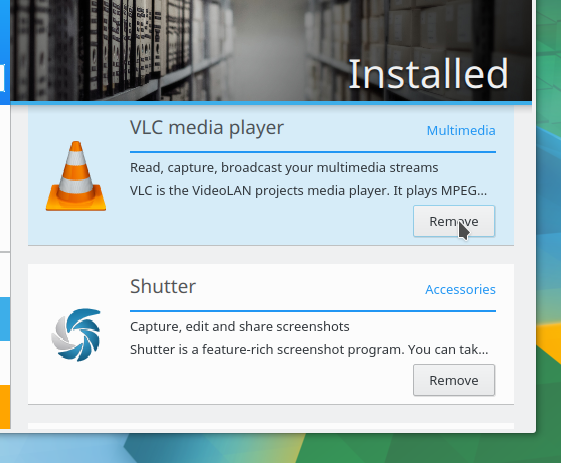 Finally, enjoy your happy life with Kubuntu! Read also Part 1 and Part 2, including How To Install Kubuntu 17.10. 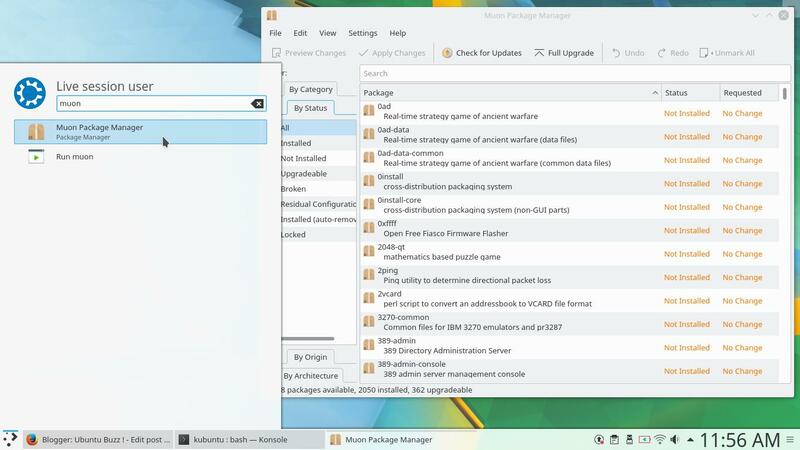 For experienced users, Muon is very similar to Synaptic, while Discover is very similar to the old Ubuntu Software Center. 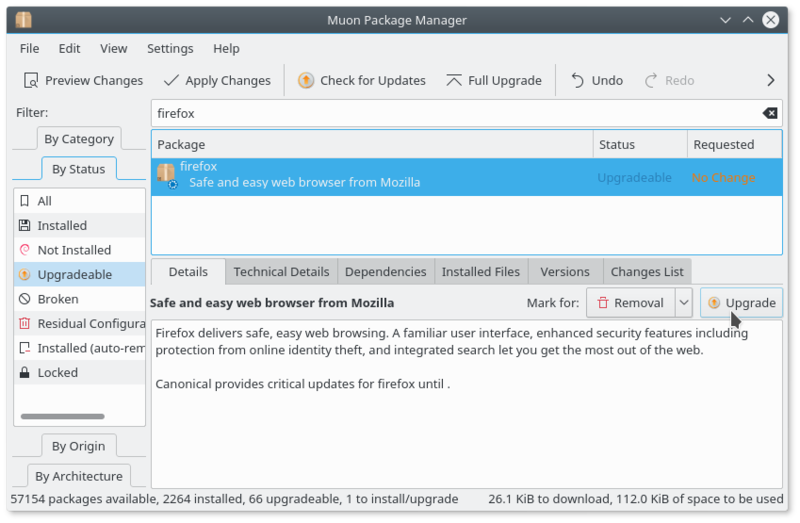 On Kubuntu, you have Discover and also Muon Package Manager as your "App Store". With these, you can find software you need and install it by click. Also, you can upgrade your software to new version. I recommend for new user to use Discover for daily use and use Muon for special purpose like upgrading or troubleshooting. 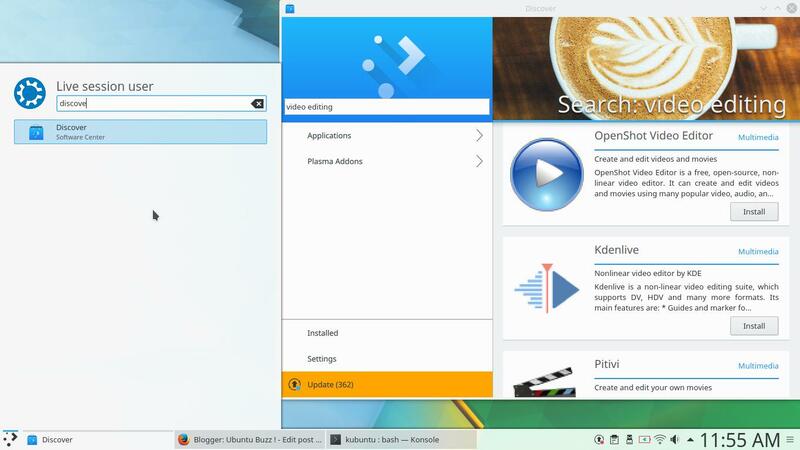 These are comparison of Windows >< Kubuntu applications. 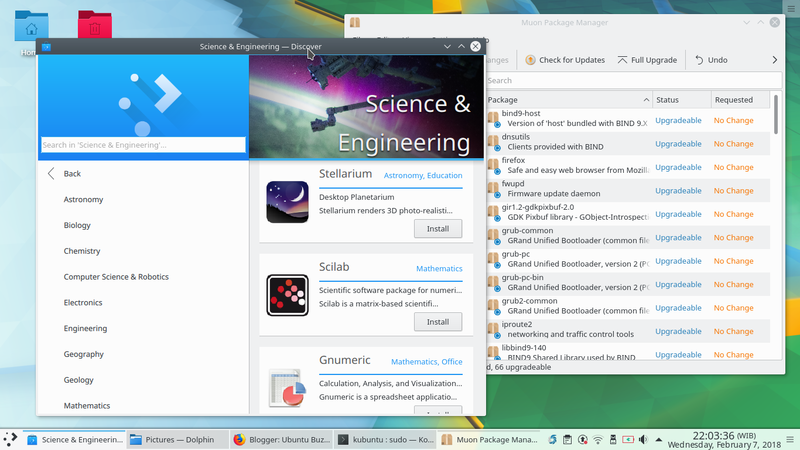 All Kubuntu applications mentioned are available on Kubuntu Discover. Just like installing software in Android, you run the App Store and install software by pressing Install button. 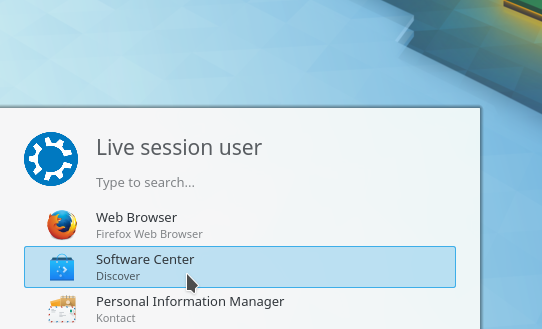 First: run Discover: open up the menu > see Software Center (Discover) there > click that icon > Discover showing. Second: find a software such as "video editor" > the Discover showing applications such as Kdenlive, OpenShot, or Pitivi > suppose you like Kdenlive > click Install button on Kdenlive to install it. Installed software will appear at menu like this. Run Discover and press Remove button at the one you want to uninstall. There are hundreds of program available in PPAs (like Persepolis, GIMP, Blender) that can be installed if you follow this section. 2) open up Discover > go to Settings > press More button > select Software Sources > a dialog appears. 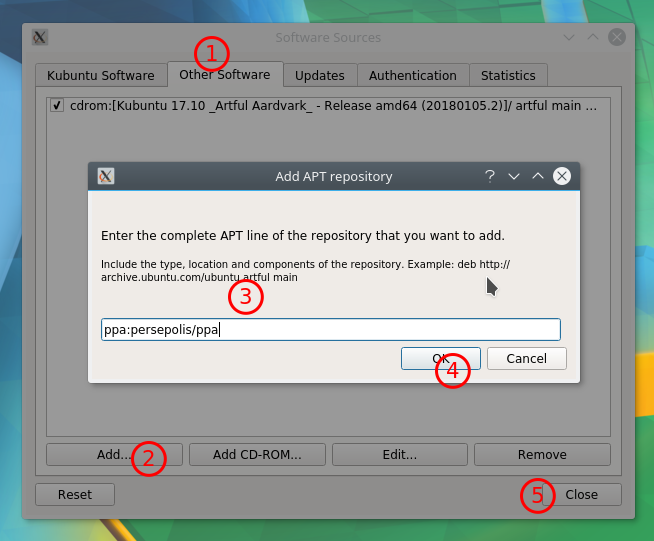 3) on the dialog Software Sources: go to 'Other Software' tab > press Add button > paste the address of PPA > press OK > press Close > finally press Reload or OK if a dialog asked to reload. 4) back to Discover: find the name "persepolis" > now Persepolis showing at the Discover > finally, press Install button. Upgrading whole system is very complicated for home user so don't do it (unless you're ready for any error), instead, upgrade only program you need to be upgraded like this section. 2) go to filter By Status > find "firefox" > press 'Upgrade' button > press Apply Changes.